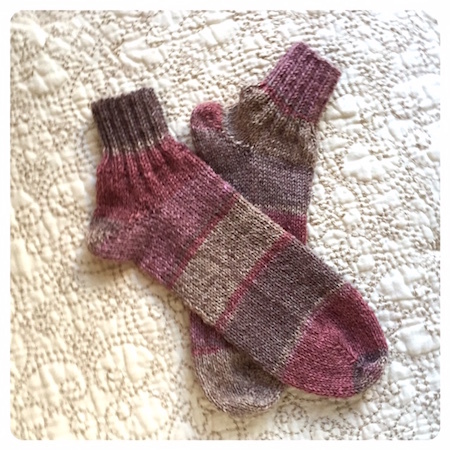 Not too long ago I made a video and a free pattern for simple socks (= Emerald Isle Socks, for which you can click HERE for reference, including links for videos for left-handed and right-handed knitters). The "Emerald Socks" are for foot US size 7-8, and an average foot width. The yarn (Wildfoote, Luxury Sock Yarn) is a little thicker than the yarn I used for my pink variegated socks (self striping yarn), so I had to use one size bigger needles to knit them. Today's post will be similar, but for a smaller foot (size US 6) and narrow foot. The socks are knitted with a short row heel and a tapered toe area, just like the "Emerald Socks." 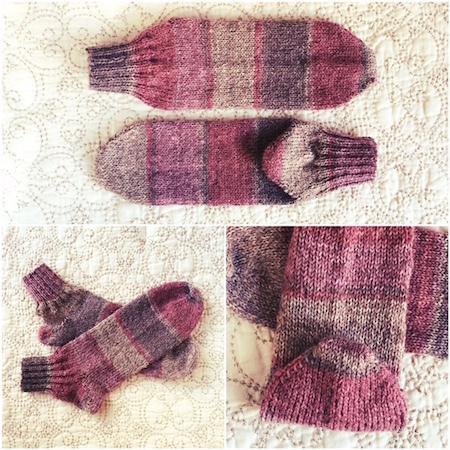 I worked with only one set of double pointed needles - 2.25mm, and slightly thinner yarn - Paton's Kroy Socks Yarn. If you do not like knitting with DPNs, you can use circular needles - but make sure you use markers. I used only one ball of yarn, and I still have a leftover yarn. 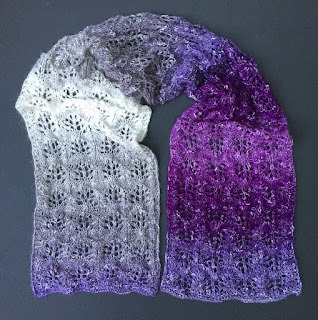 I am wondering if I could make one more pair for a newborn baby. Since there is a little yarn left, I believe you could make your socks either wider, or slightly longer, or knit a bit longer ribbing for your socks. Enjoy. 1 ball of Paton's Kroy Socks Yarn 75% Washable Wool/25% Nylon; 166 yds (152 m); 1.75 oz (50 gr), color "Brown Rose Marl"
These socks are approximately for ankles about 6" around and will stretch up to 6.5" around. Add 4 extra stitches to make socks about 0.75" wider. 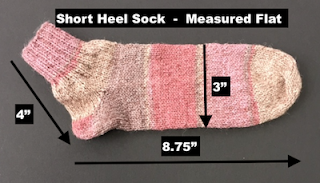 The length of these socks is 8.75", and can stretch a little too. Note: For shorter socks knit lower number of rows between your finished heel and before you start knitting your toe area. Move stitches from a needle #2 onto needle #1 and stitches from a needle #3 onto needle #4. Use Kitchener stitches to seam two sets of live stitches (10 sts & 10 sts) invisibly. See my detailed video how to do the Kitchener stitch in my Emerald sock video 3/3. The link is at the top of this page, when you open the "Emerald Socks" post, click on Playlist for videos.